The Order of Merit of the Federal Republic of Germany (German: Verdienstorden der Bundesrepublik Deutschland, or Bundesverdienstorden, BVO) is the only federal decoration of Germany. It was created by the first President of the Federal Republic of Germany, Theodor Heuss, on 7 September 1951, and has been awarded to over 200,000 individuals in total, both Germans and foreigners. Since the 1990s the number of annual awards has declined from over 4,000, first to around 2,300–2,500 per year, and now under 2,000, with a low of 1752 in 2011. In recent years women have made up a steady 30–31% of recipients. 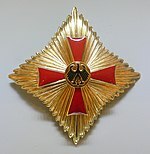 Colloquially, the decorations of the different classes of the Order are also known as the Federal Cross of Merit (Bundesverdienstkreuz). Most of the German federal states (Länder) have each their own order of merit as well, with the exception of the Free and Hanseatic Cities of Bremen and Hamburg, which reject any orders (by old tradition their citizens, particularly former or present senators, will refuse any decoration in the form of an order — the most famous example: former Chancellor Helmut Schmidt). Desiring to visibly express recognition and gratitude to deserving men and women of the German people and of foreign countries, on the second Anniversary of the Federal Republic of Germany, I establish the Order of Merit of the Federal Republic of Germany. It is awarded for achievements that served the rebuilding of the country in the fields of political, socio-economic and intellectual activity, and is intended to mean an award of all those whose work contributes to the peaceful rise of the Federal Republic of Germany. Grand Cross special class (Sonderstufe des Großkreuzes); the highest class of the Order reserved for heads of state. The President of the Federal Republic holds the Grand Cross special class ex officio. It is awarded to him in a ceremony by the President of the Bundestag, attended by the Chancellor of Germany, the President of the Bundesrat, and the Supreme Court President. Other than the German president, only a foreign head of state and their spouse can be awarded with this highest class. There is also the provision of awarding the Grand Cross in a "special issue" with laurel wreath design (Großkreuz in besonderer Ausführung), in which the central medallion with the black eagle is surrounded by a stylized laurel wreath in relief. This Grand Cross special issue has been awarded so far only twice, to former German chancellors Konrad Adenauer and Helmut Kohl. The badge is a golden cross enamelled in red, with a central disc bearing a black eagle. The star is a golden star with straight rays, its size and points vary according to class, with the badge superimposed upon it. The riband is red with gold-black-gold stripes. 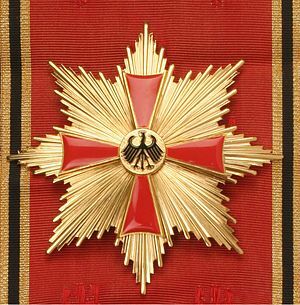 Badge and riband of the class "Grand Cross"
Star of the class "Grand Cross"
Star of the class "Knight Commander's Cross"
Badge suspended on neck riband of the class "Commander's Cross"
For a more comprehensive list, see List of recipients of the Order of Merit of the Federal Republic of Germany. ^ "Verdienstorden der Bundesrepublik Deutschland". www.bundespraesident.de (in German). Retrieved 27 March 2018. ^ The Oxford dictionary of abbreviations (2nd ed.). Oxford University Press. p. 70. ISBN 9780192800732. Retrieved 27 October 2018. ^ Binder, Elisabeth (6 September 2001). "Bundesverdienstkreuz: Das Kreuz mit dem Dank". Der Tagesspiegel (in German). Retrieved 22 March 2017. ^ Wördehoff, Bernhard (26 May 1989). "Ehre in Serie". Die Zeit (in German). Hamburg. Retrieved 22 September 2018. ^ "Ordensstufen des Verdienstordens der Bundesrepublik Deutschland" (PDF). auswaertiges-amt.de. German Federal Foreign Office. Retrieved 27 March 2018. ^ "Bundesverdienstkreuz mit Lorbeerkranz für Kohl" (in German). Rhein-Zeitung. 26 October 1998. ^ Hieronymussen, P. O., Orders and Decorations of Europe in Color	(London: Macmillan Publishers, 1967). 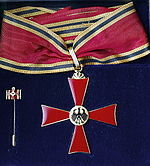 Wikimedia Commons has media related to Order of Merit of the Federal Republic of Germany.